This month Colin Moore became the latest employee from metal railings and gates manufacturer Alpha Rail to celebrate a milestone anniversary. Colin, who is celebrating his 20 year anniversary, works in the Alpha Rail finishing department and joins a band of eight employees who over the last two years have been at Alpha Rail for 20 years or more. In total they have clocked up more than 240 years service. 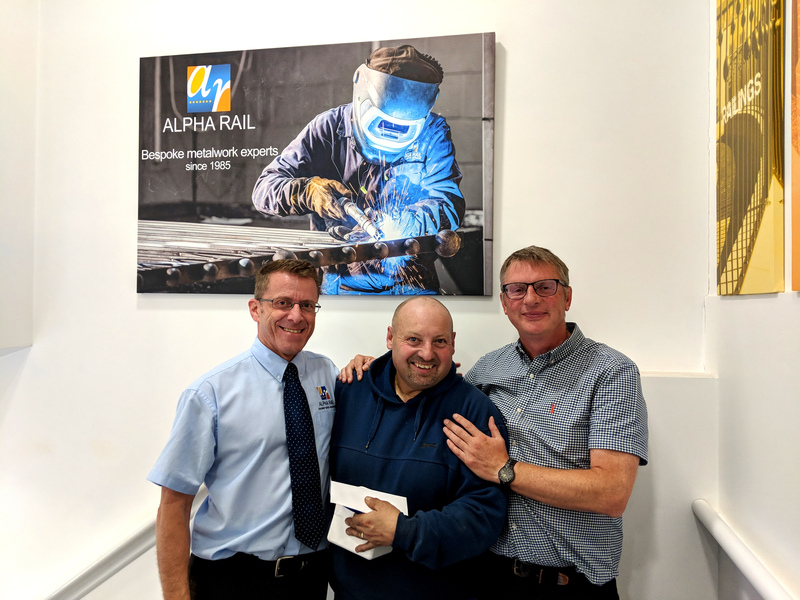 In recognition of work anniversaries, Alpha Rail present everyone who reaches a 20th anniversary with a commemorative gift. Colin chose to receive gift vouchers. Alpha Rail has been manufacturing metal railings, gates and pedestrian guardrail for over 30 years, and is proud to be one of the UK’s leading manufacturers of bespoke metalwork. Local high-profile projects include the Highfields Park Restoration Project, and Forest Recreation Ground, venue of the infamous Goose Fair.